Taco Should Be a Verb. 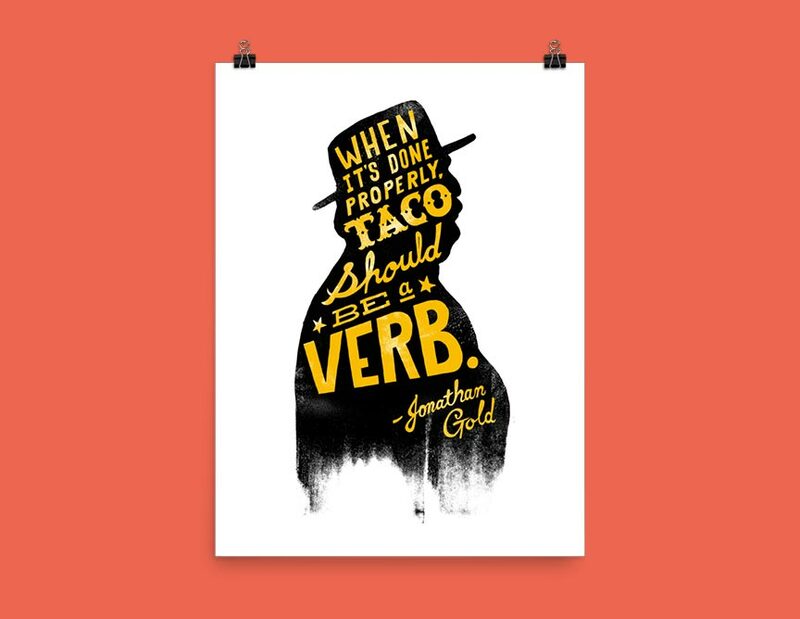 To celebrate the passing of legendary food writer and critic, Jonathan Gold, I created a design to honor one of his favorite quotes of mine "If done properly, taco should be a verb." I first heard this in the documentary on the man, City of Gold, and it has stuck with me every since. Sold out on 20x200.com, kickstarted the ubiquitous 'words on type' tumblr trope, featured on numerous design blogs and ad pitches, ripped off by American Eagle Outfitters, plastered on the walls of young girls bedrooms and made me internet famous for a hot minute. Recently the city of Portland has been hemorrhaging iconic local institutions like Club 21, Besaws, Matador, Produce Row, the Gypsy, Pal's Shanty, Slabtown and the indelible Magic Gardens. So like Rome, Brooklyn and Seattle before it, Portland is officially over and I made the poster. You can even buy one. This is the sound we made and the light that was emitted at the Pinhook in Durham on the night of November 11, 2012. Footage includes John Whitney's "Catalog" 1961 and found film.